Added on June 11, 2018 by Rodrigo Beilfuss. And here we are, up and running at Stratford's 66th season, and my 3rd. 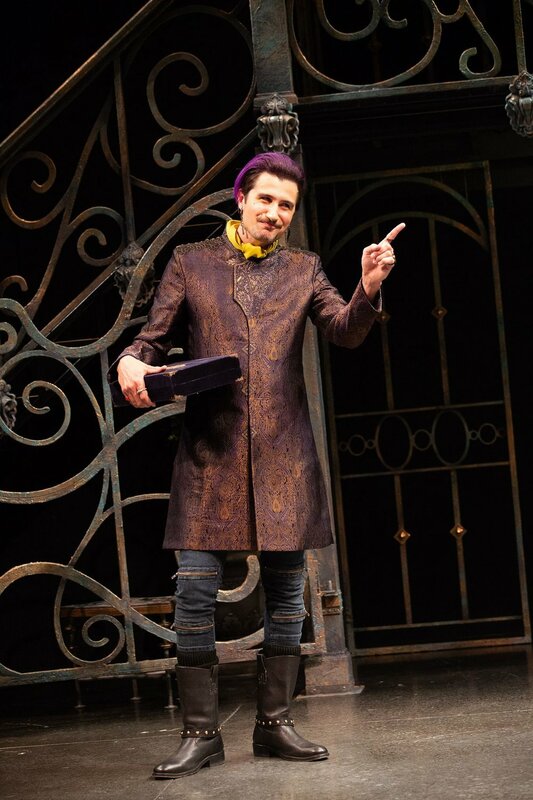 I've been having a blast with the funniest and most generous group of actors in the Comedy of Errors, playing the Goldsmith Angelo (picture above). It's a wacky and colourful production, and we've been selling out at the Studio Theatre. Other than that, I've been keeping up with my understudying duties for the mighty show Long Day's Journey Into Night - I cover Jamie Tyrone, the volatile, drunk older brother. It's been a challenge: how to lift and own these words without really rehearsing at all...I'm learning a lot. Added on January 17, 2017 by Rodrigo Beilfuss. Here we are, approaching the end of my time with the Stratford Festival's Birmingham Conservatory for Classical Theatre. There are 4 weeks left, as I type this. It's been an absolutely intense couple of years - plus a full Festival season in between. As part of our last project, we will present Shakespeare's highly "Chekhovian" tragicomedy AS YOU LIKE IT, fully mounted, at the Studio Theatre in downtown Stratford - directed by a truly sweet American, Jon Kretzu, from Portland. Kretzu is intensely passionate about the play, and it's been a pleasure to watch him unfold his vision for our production during rehearsals. For my part, I'm having a go at Jaques (sad-looking picture above), the melancholy traveller. I absolutely adore it, as it allows me to truly explore that mysterious "humorous sadness" that is so common in Anton Chekhov's work (whom I'm a fan of). I hope to see you at the Studio; you'll have only two chances to see the show: Feb 10 +11, both performances at 2PM - it's free! After that, I'll enjoy a bit of a break: two weeks in Winnipeg; and then back to Stratford for rehearsals for the 2017 season...it's all happening pretty quickly. Life! Added on December 14, 2016 by Rodrigo Beilfuss. Quick update, because, once again, as always, life is bonkers and the bonkers season (the Holidays) are upon us. My first season at Stratford has come to a closure. 'Twas a brilliant challenge. I'm already scheduled to come back for a second season, appearing in The Changeling, The Madwoman of Chaillot and Timon of Athens - all three productions will take place at the lovely Tom Patterson Theatre (pictured above). Currently, I'm back in training, in my second (and final) year at the Stratford Festival's Birmingham Conservatory for Classical Theatre (I'll be done in February, 3 weeks before rehearsals for the season begin). We are presenting Marlowe's rare jewel DIDO QUEEN OF CARTHAGE this week, before we break for Christmas. Fatherhood is awesome and I'm perpetually exhausted, but that's ok.
AND, finally, Bravura Theatre, my Winnipeg-based company, is collaborating with a school in Belize on a Shakespeare project. My awesome Associate Artistic Director Dora Carroll will teach a workshop at the Ocean Academy High School. MORE INFO AND DONATION LINK, RIGHT HERE. Added on September 7, 2016 by Rodrigo Beilfuss. As the kids say, it's been all "hashtag blessed" stuff from this end over here. That is not to say, however, that it's all been peachy peachy bed of roses. Indeed, between fatherhood, moving to a new place, teaching workshops with the Festival and running three shows in rep, this summer has been one deliciously challenging mountain. The Aeneid (picture above) is a challenging mountain of its own. The rehearsal process was highly physical (it is primarily a movement-based piece of theatre), and the story itself, the plight of refugees, requires great emotional commitment. I love doing the show every time, but it does break my heart - if you come see it, and you know me, you'll know why specifically. I've been rather lucky in that I got to experiment with my "acting muscles" this season, in terms of style and tone of performances. Macbeth requires me to be "butch" and incredibly efficient (I only speak some 4 lines, but I change costumes some 18 times and run around like a mad man); All My Sons requires me to be light, comic even - it's pretty fun; and The Aeneid is made of the heavy Roman Tragedy stuff that requires deep dramatic commitment. Added on December 3, 2015 by Rodrigo Beilfuss. I became a Canadian citizen today. Yes, finally! Feels great. Many of you probably thought I was one already. Well, no. You know why? Because it's not easy. It takes time. A long time. AND a lot of money. No matter who you are, or where you come from, or who you marry or don't marry - even if you come into this country as a refugee: you pay. And you wait. And you wait. And you wait. I was an International Student for a number of years. And then a Temporary (Worker) Resident for a couple of other years. And then a Permanent Resident (Landed Immigrant) for nearly 6 years. I applied for Citizenship on December 2012, and only now I was finally allowed to take my Oath of Citizenship. Granted, my moving to the UK delayed the process, as one isn't allowed to apply for Citizenship from abroad; but, regardless: the backlog in applications is quite scary (just go to the Canadian Immigration website and have a look at the application processing times. Everything takes ages to get done; years - it's a tremendously complex system). So, here's my point: shockingly, many people persist in thinking that it's relatively easy for one to just pack up, find himself a nice Canadian, get married, and voila: passport. The reality couldn't be further from the truth. It takes time. And yes, as already mentioned: money. The system was completely revised under the Conservatives. Fees were hiked and everything took much longer to get processed. The goal, of course, was to ultimately discourage people from moving to Canada - as simple as that. The passive-aggressive politics of fear at work. So why bother coming into this country at all, you might ask?! "You didn't HAVE to move here", you may add. "If you don't like it, go home", you may reply - if you are, you know, mean. Well, this is the 21st century. People move about for all sorts of reasons: work, love, health, survival...I assure you, nobody, not one living soul in the world, wakes up one morning and simply decides to leave his or her home-country on a whim. There's always a reason. A valid reason behind it all. A human reason often dictated by need. Real effin' need. I love living in Canada. It's my home. People I love live here. The work I love to do is here. My child will be born here. I invested my time, effort and, yes, my money into the idea of becoming a citizen. And yes it was worth it, of course! Canada is a truly remarkable place to call Home. Do I feel "proud", or do I think "omg I love Tim Horton's coffee" right now? No. Citizenship wasn't magically bestowed upon me - as if it were a sweet gift from benevolent Gods that promptly re-wires one's whole brain. It is not a complete reboot of one's identity. It is, above all, an exchange of mutual respect; a formal expression of commitment: and *both* parties have a lot to offer to each other. People have always wandered this Earth in search of a space to breathe. That's all. And, of course, massive thanks to Liz and her family, who've been such supportive, patient anchors in my Canuck journey. But right now: gimme some proper Canadian bacon + Canadian Club whisky, on the rocks, please. A new home in Stratford. Added on October 2, 2015 by Rodrigo Beilfuss. I write this note all comfy and cozy in my sweats, in my new flat in Stratford, Ontario. I've been a resident of this wonderful little city for nearly a month now, and it has been tremendously fun and surprisingly easy to adapt to the place. The training at the Festival's Birmingham Conservatory for Classical Theatre is vigorous - in fact, more vigorous than what I experienced at LAMDA; because it feels more personal, and more guided towards the professional discipline of acting (rather than the educational discipline of the craft) - indeed, I'm not in a school over here. I'm being paid to train in the ways they do things here. More specifically, in the ways Martha Henry sees fit! (She's amazing). This is work. It's my job. I've been training with a group of 10 young actors of diverse backgrounds - both culturally and professionally; a stupidly talented group. It's actually terrifying just how bleeding good these people are. I feel like there's much to be shared with you, though I sit here and don't even know where to begin or what to say exactly...so I will leave you with this: the only way one can ever feel wholeheartedly fulfilled in this life is by following his/her passions in a way that there is never any fear of embarrassment. Added on August 11, 2015 by Rodrigo Beilfuss. My good friend James Magnus-Johnston and I have been plotting. We share many interests beyond theatre, science being one of them. In fact, besides being an amazing performer and singer, James is also an Ecological Economist trained at Cambridge. So I thought it would be fun to host an evening of socio-political discussions centred around the environment at the super hip Fools & Horses Coffee Co. (which is partly owned by James!). The picture and quote above is from a play called "2071", co-written by Dr Chris Rapley and dramatist Duncan Macmillan (Lungs). It was presented at the Royal Court Theatre last year, and it caused a lot of buzz and debate. Essentially, it's a play about how royally screwed we are. I read the script and it instantly gave me anxiety. It's a beautifully crafted call for collective action. James and I will be talking about this play, and other works of art that cover the environment and climate change, on Friday, August 21, at 7PM. He will also share with us his absolutely vast knowledge on the subject of post-growth economics and a waste-free world! All of that with a great dose of drama, and on the cheap: free! More information right HERE. Added on June 18, 2015 by Rodrigo Beilfuss. I'm currently in rehearsals for a superb one-man show called Sea Wall, originally written in 2008 for the Bush Theatre in West London, by one of Britain's most prolific writers, Simon Stephens (pictured) . Sea Wall will be presented by Theatre by the River, and you can visit their website for more information on tickets and such - as well as the Fringe Festival site for more information on venues/tickets. It was recently remounted in Ireland, starring the ever watchable Andrew Scott; you can read about their production right HERE. This is my last performance in Winnipeg before I leave for Ontario to take part in THIS - so make sure you come out and say hello!